Most locomotives in the United States were not built by the railroads themselves. But over the decades, some of the major railroads developed repair shops and foundries so complete and capable that they began to design and build their own locomotives. This particular locomotive was built by the Southern Pacific, for the Southern Pacific, in their Sacramento shops in 1921. Used primarily as a switch engine, #1273 nevertheless logged 1,500,000 miles during it's 35 years of service. 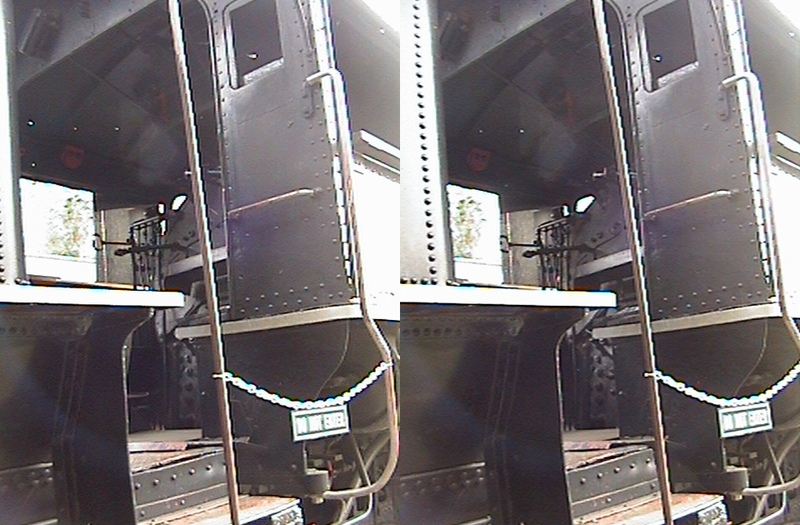 Locomotives, like automobiles, had controls uniformly positioned in the cab. 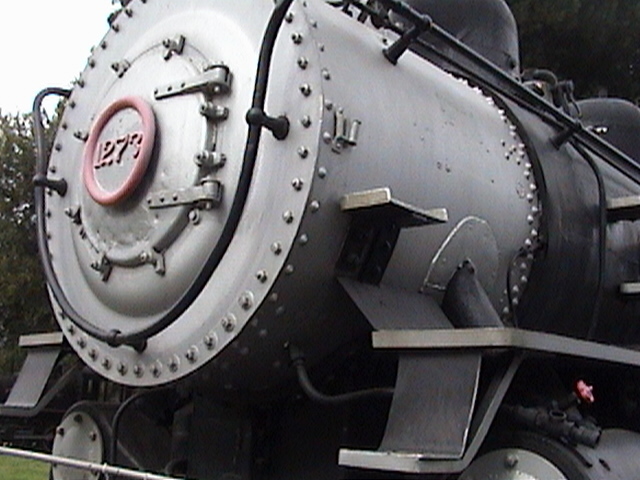 The throttle, reverse lever, brakes, and other controls for operating the locomotive were always on the right side of the cab, called the engineer's side. The fireman's place, therefore, was on the left side of the cab, from where he would stoke the boiler's firebox with wood, or in later years, coal or oil, so that the fire in the boiler would keep the steam at the temperature and pressure required by the engineer. After the turn of the century, more and more western locomotives were built to burn oil as fuel, and the job of the fireman changed from frantically shoveling to watching gauges and using valves to control the fire in the boiler. Although the conductor was boss on the train, the engineer was the one who controlled the raw power of the machine, and had the safety of the passengers and crew in his hands. To become an engineer usually required a high level of seniority, working one's way up from crewman to fireman and finally to engineer. Throughout the history of railroading, and even today, the most important, exciting and romantic job on the railroad is the job of the engineer. Steam in the top, compressed air out of the bottom. Dual action piston on top cycles automatically with a "Shortend Stroke" valve (that's the small rod in the center) to drive the main rod that compresses atmospheric air, intake from a filter, to a pressure vessel (tank) to maintain the brake line pressure. 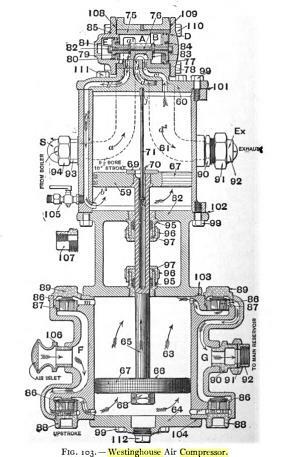 If the line is dumped, or slowly released, springs on each car in the train no longer hold the brakes away from the wheels, which apply the brakes until line pressure is restored, releasing the brakes by overcoming the springs. Each brake shoe is balanced in equilibrium with all the others, applying exactly the same dynamic pressure evenly along the entire train. 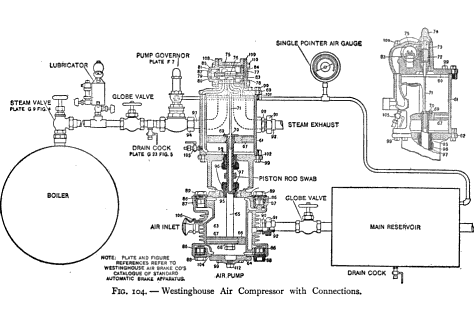 There are many ways to compress air, this is the most common on steam locomotives. Identical pumps can also be used to compress feed water into the boiler, so often there will be two compressors on the fireman's side of the engine. 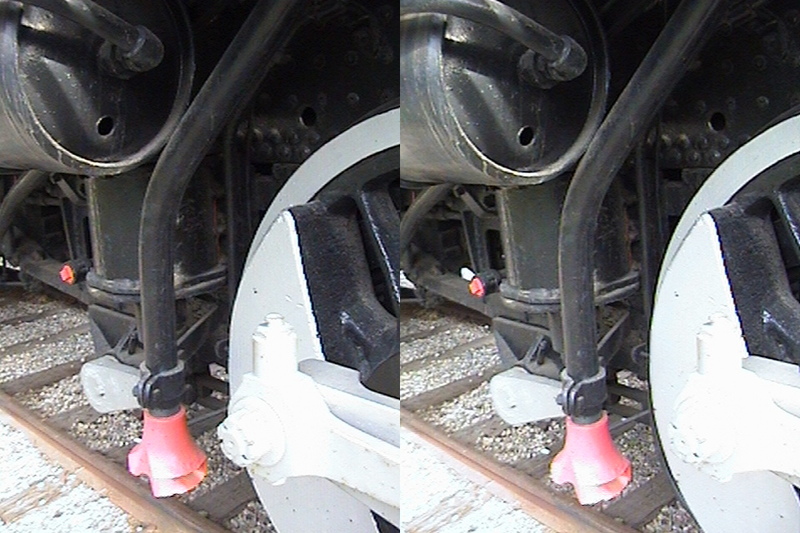 One to maintain the boiler water level and one to maintain the brake system air pressure. Why not just use steam pressure? Steam pressure changes depending on the load of the locomotive and this isolates that variability. 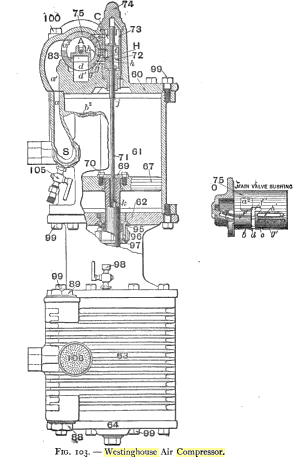 But more importantly, steam condenses into water when cooled, taking up less volume -decreasing the pressure - applying the brakes, and worse is the maintenance nightmare of water rusting the interior of the brake system parts. The moisture in the air, when compressed, precipitates out and is caught in the first pressure storage tank, which is why one finds a drain valve at the bottom of it. 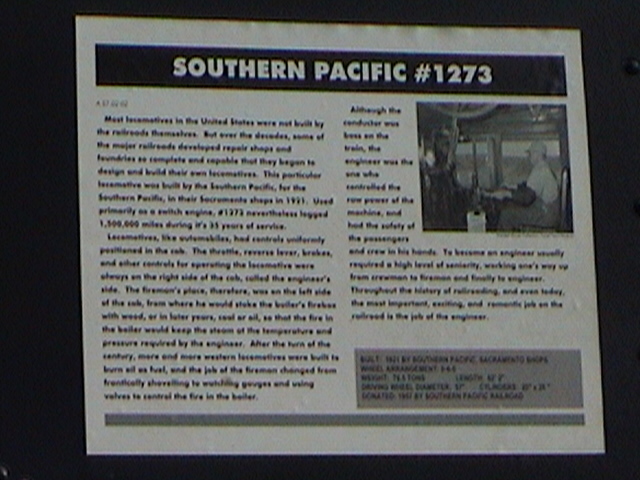 Also see:Southern Pacific Locomotive Number #1273 in the Griffith Park Gallery.